Great Taste Magazine 2009 March April Issue features Chef Art Gonzalez and culinary news, tips, recommendations and recipes from Orange County restaurant chefs. In tough economic times restaurants prevail. 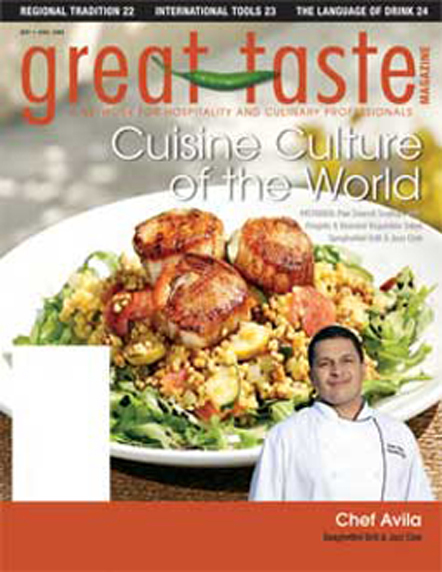 Great Taste examines how the restaurant industry stays recession proof with happy hours, promotions and prix fixe dinners. 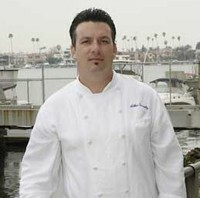 Our featured chef, Chef Arthur Gonzalez from McKenna’s On the Bay, is one of the many chefs thriving during the economic crisis. He tells us how he has survived and what his hopes for the future are. For those brave souls looking to become restaurateurs, we have a recipe for success for running an exquisite restaurant. Another thriving enterprise is the Santa Monica’s Farmers Market. Part of the California Certified Farmers’ Markets (CFMs), the Wednesday market covers five blocks and provides inspiration for Chefs and foodies alike with fresh fruits and veggies. Continuing our look at sustainable trends in the restaurant industry is the latest evolution in libations: Mocktails and Cocktails. Signature drinks are a staple at any successful restaurant and many restaurateurs are becoming experts in the world of mixed drinks and their non-alcoholic alternatives. In this issues beverage section we provide a guide through some of the more popular trends and why cocktails are one trend that is here to stay. Finally, we end our spring issue with a suggestion for your bed -the bed your dishes are created upon that is. We all get tired of the same old stuff so we suggest using the old island staple, Johnnycakes. Start there, build your way up and see what delicious new creation you can come up with. Great Taste Magazine 2009 March April Issue covers the restaurants and the professionals with resources, recipes, beautiful photos and many tasty tidbits. Great Taste Magazine, the premiere connection to all the key decision makers in our local Southern California restaurant industry. Each month our 15 year-old full-color trade publication reaches thousands of the area’s top restaurant owners, general managers, executive chefs and buyers. Take a tour through the magazine. Each issue features a restaurant and local chef, and is packed with the timeliest information, critical operational tips and other industry news important to our readers. Update! Even in these tough economic times, it’s clear our readers still have Great Taste! We’re happy to announce that our circulation has increased and we’d like to thank each and every one of our readers for helping make Great Taste Magazine the go-to source for Orange County restaurant information. If you’d like to join in on the fun, let us know Click here to send us an email (please enter which you’d like to subscribe to in the subject line). Teri Williams has her finger on the pulse of the local hospitality industry like no one else. Fifteen years as editor and publisher of Orange County’s only hospitality trade magazine combined with her consultancy for the non-profit sector and her public relations expertise give Williams a far-reaching, varied and unique perspective of the industry. Besides her esteemed Great Taste publication, she has extensive experience in the travel industry (retail agent and wholesale), event planning and volunteerism. Williams has contacts around the globe in the restaurant, hotel, media and travel trades. She has also been applauded for her enthusiastic charity work and has chaired numerous chef, food and wine events on behalf of local non-profit organizations, for which she has helped garner more than $1 million in donations through the years. Known for her unflagging enthusiasm, entrepreneurial spirit, can do attitude and joie de vivre, Williams is a constant presence and authority on the OC culinary and hospitality scene. Great Taste would not exist without our enthusiastic and generous contributors, which is why we want to turn the spotlight on them! We’ve got chefs and students, teachers and experts – so read on to meet the wonderful people that write for your pleasure. They all have Great Taste!